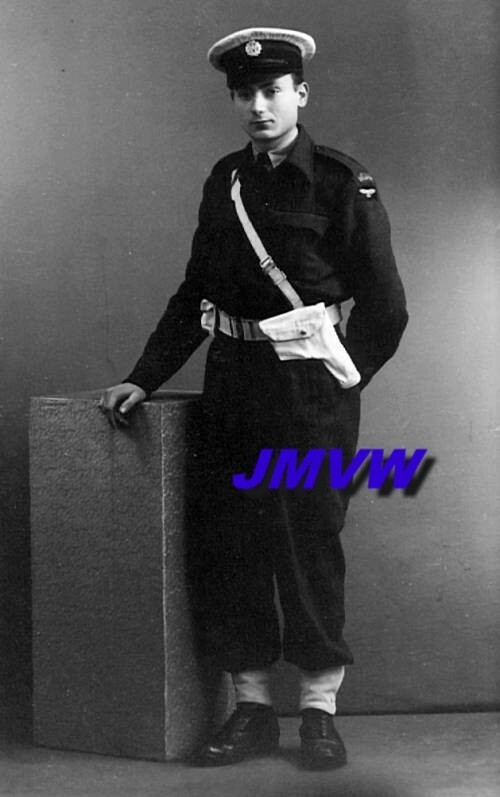 On April 10 1945, 2 BAAPS units were raised : BAAPS I at Gosselies, and BAAPS II at Uccle, near Brussels. The men were chosen between the more elder military. 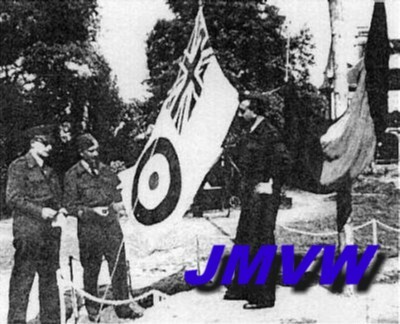 The main task of the BAAPS was : to help the Allied Military Police in their task of guarding the airfields. 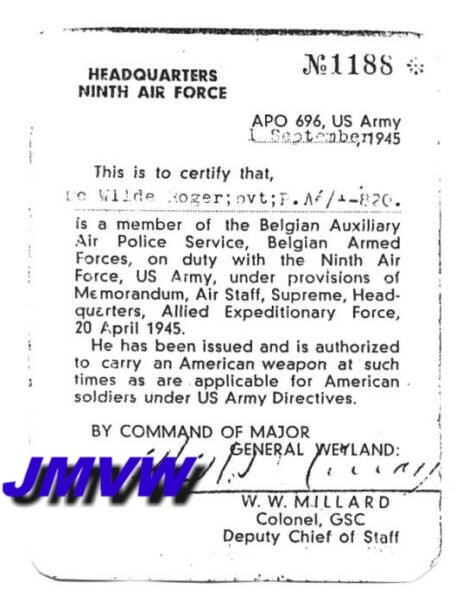 of the British Liberation Army on the same date. BAAPS II, correspondence. BAAPS I, authorisation to carry a gun. The BAAPS I consisted of 1.200 men, NCO's and officers, organised in 23 companies and 1 staff company. The BAAPS II consisted of 1.000 men, NCO's and officers, organised in 3 companies and 1 staff company. 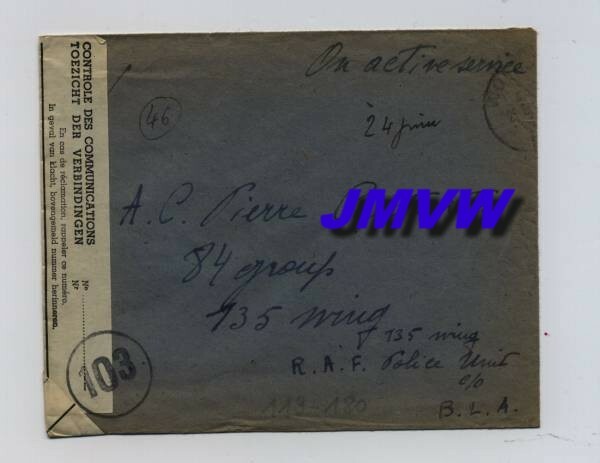 from May 15 1945 until May 31 1946. 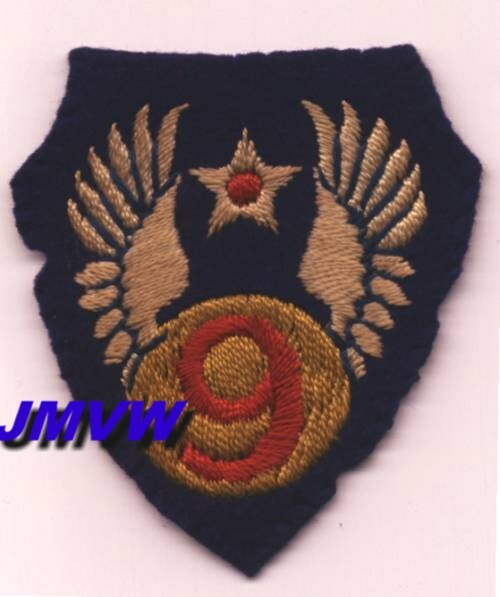 BAAPS I Squad, still in British uniform, but already wearing the Formation Badge of the 9th US Air Force. BAAPS I Bundlach - Bayreuth. 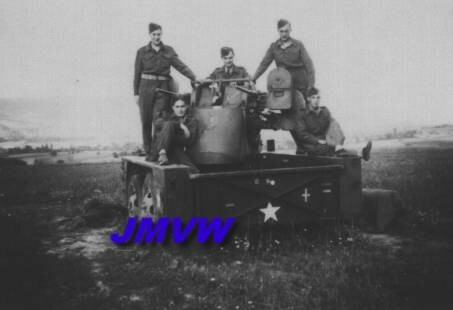 July 1945, posing on a AA gun. BAAPS I companies were in Kassel, Bad-Kissinger, Erlangen, Nurnberg. 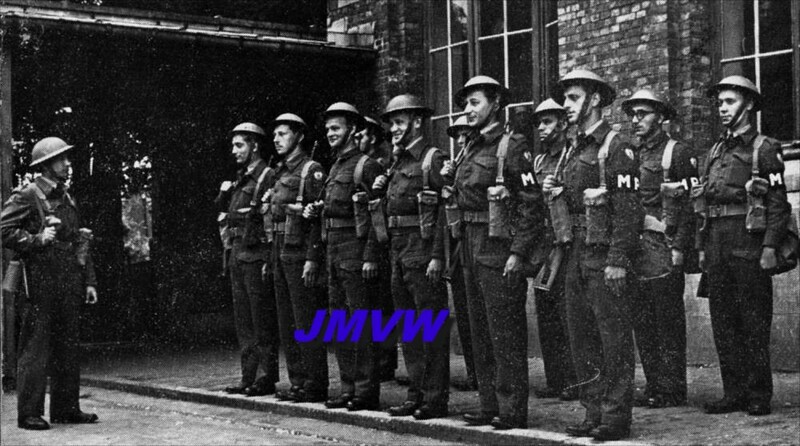 as MP's to police the troops on leave and the guarding of nazi prisonners. 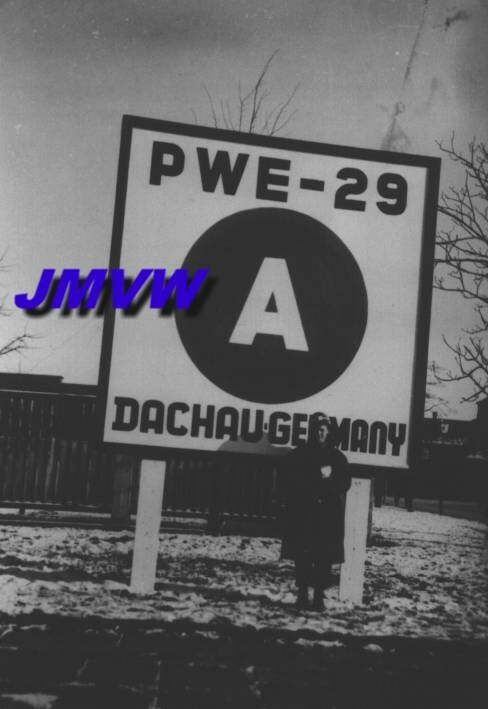 from August 1945 until September 1946. BAAPS I, Oberwiesenfeld near Munchen. 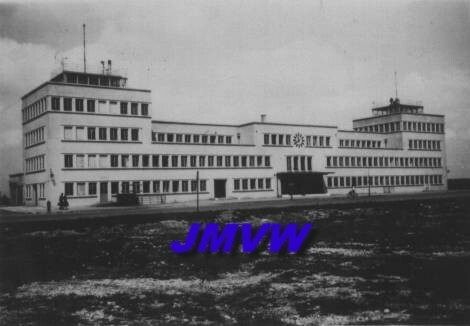 December 1945, airport R 74, main building. BAAPS I, guard duty at Dachau, Germany. BAAPS II companies were in Celles, Bad Meinberg, Güterslöh. 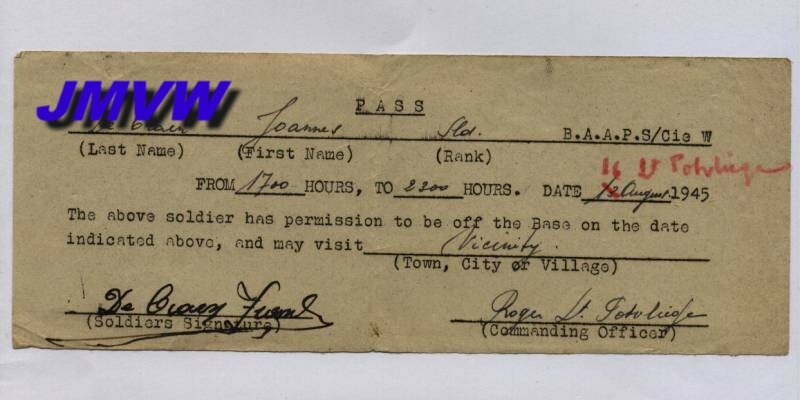 The BAAPS I was disbanded on July 10 1946. 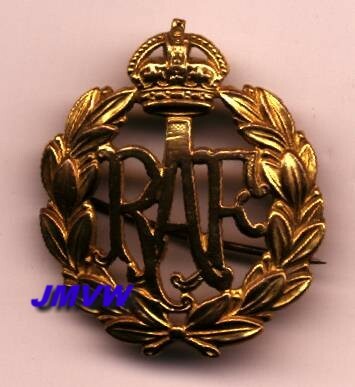 The BAAPS II was disbanded in September 1946. BAAPS II at Uccle : RAF and Belgian colours sise by side. BAAPS I : leave pass. BAAPS II : Major BONNEVIE and Major VAN DER STICHELEN. 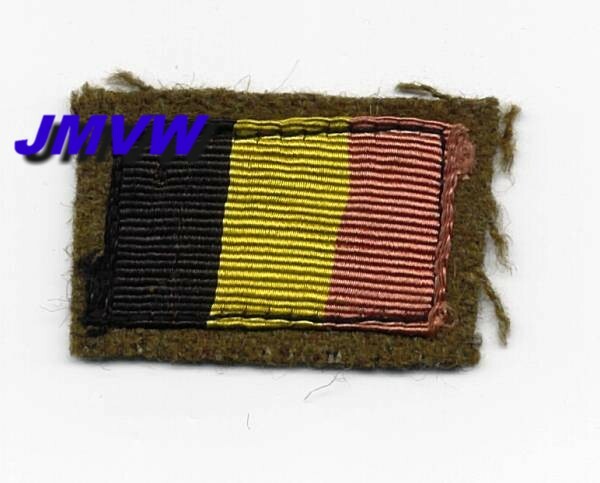 but Belgian rank insignia were worn during the whole period. 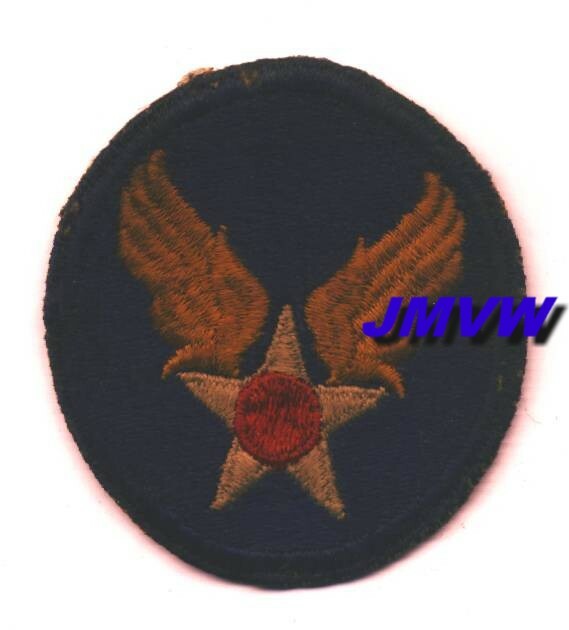 the formation badge of the Headquarters of the American Army Air Forces. A white five-pointed star, a red circle in the centre, and two yelow wings. The whole set on a blue circular background. 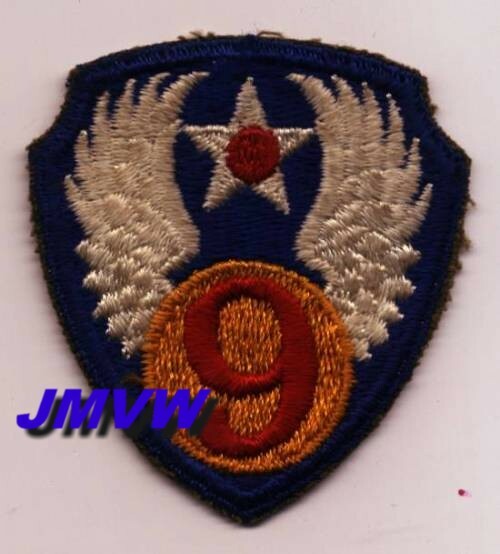 the formation badge of the 9th US Air Force. 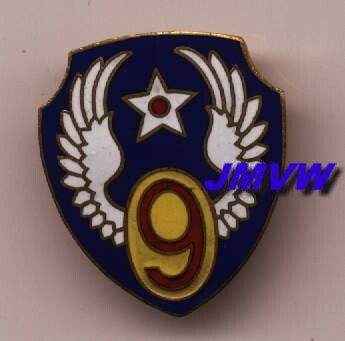 A red 9 on a yellow circle, flanked with two white wings, and an Air Force star above. The whole on a blue heraldic shield. 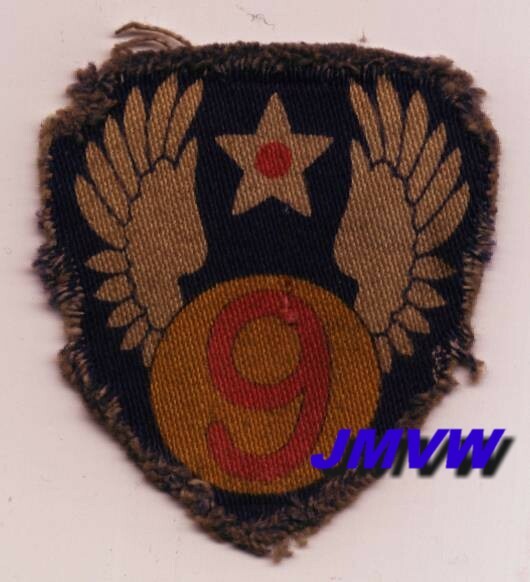 and the Belgian manufactured version of the 9th US Air Force formation badge. 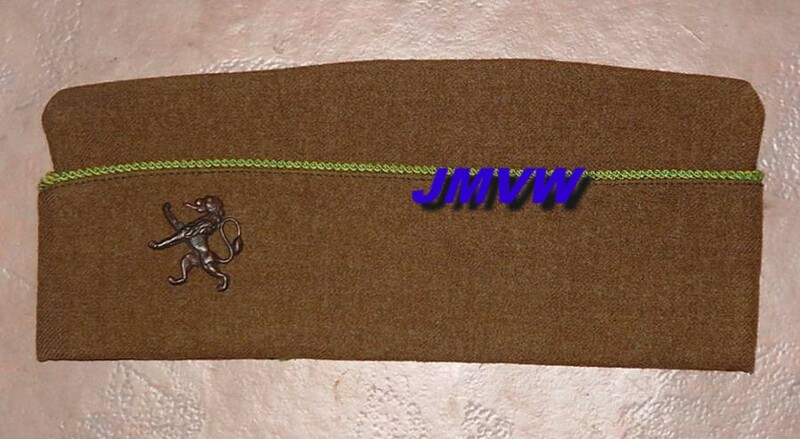 The Belgian lion was worn on the field cap. 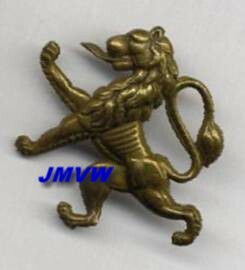 The Belgian lion, brass version. 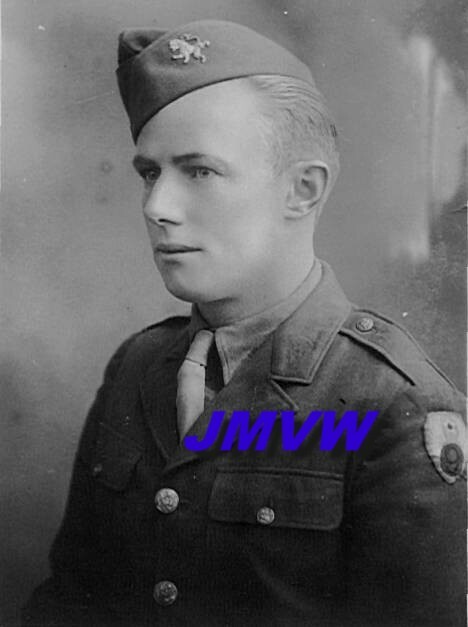 US Field Cap as worn by the men of the BAAPS I. 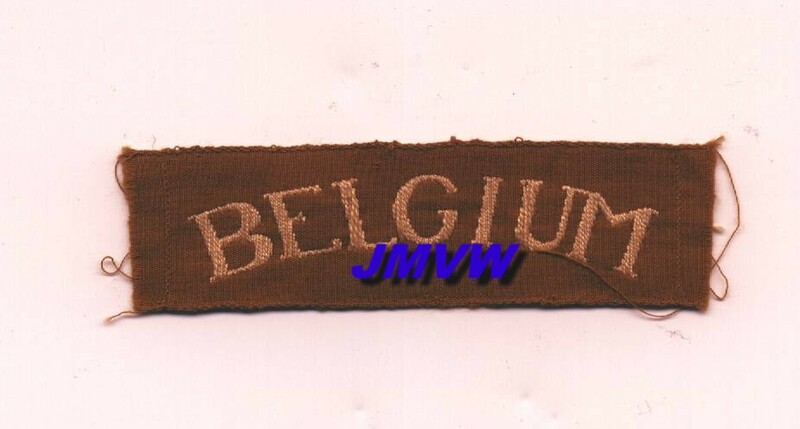 A "BELGIUM" title was worn on the left arm. 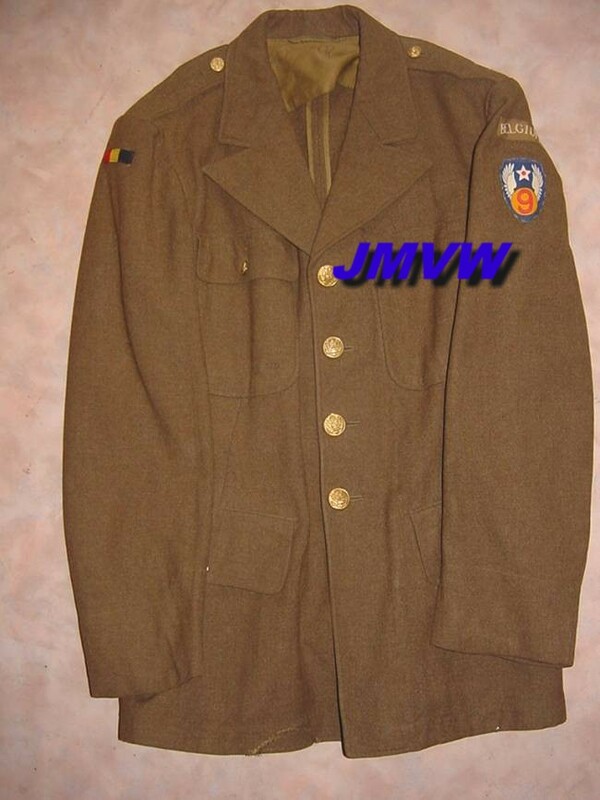 Several models were worn, but all had white capital letters on a khaki background. The Belgian national colours were worn on the right arm. 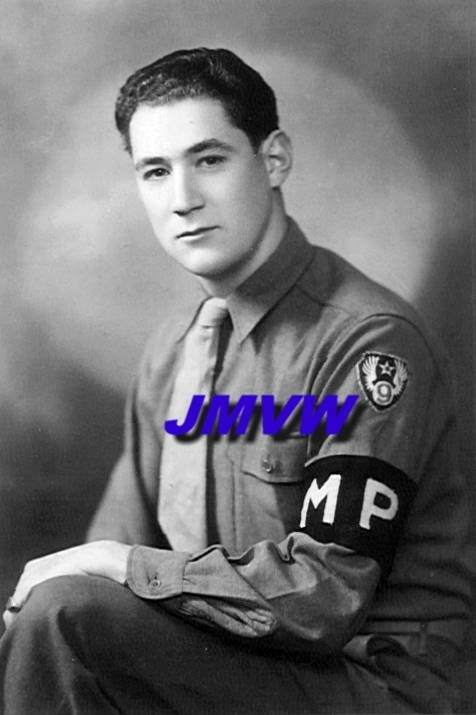 On duty, the BAAPS I men wore the US "MP" armband. White capital letters on a black armband. was worn by the men of the BAAPS I. 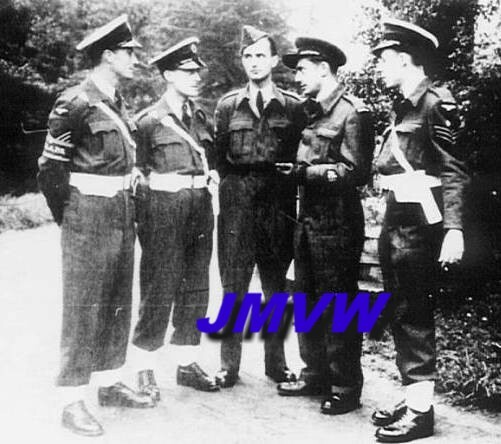 The BAAPS II men wore a RAF battle dress with British rank insignia. The "BELGIUM" arm title was worn on the left arm. White capital letters on a curved dark blue background. Under the national colours and the "BELGIUM" arm title, the RAF eagle was worn on both arms. 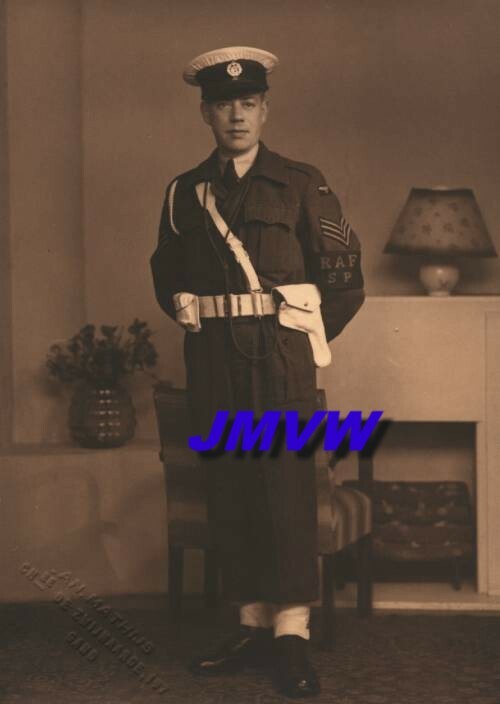 The RAF badge was worn, as well on the service cap as on the field cap. 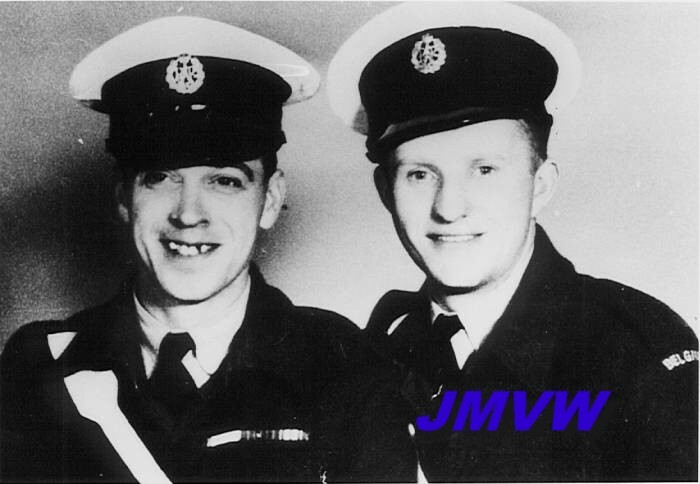 RAF cap badge Airmen VAN DAMME and LACROIX wearing the RAF cap and the "BELGIUM" title. 3 different armbands were worn by the BAAPS II men. 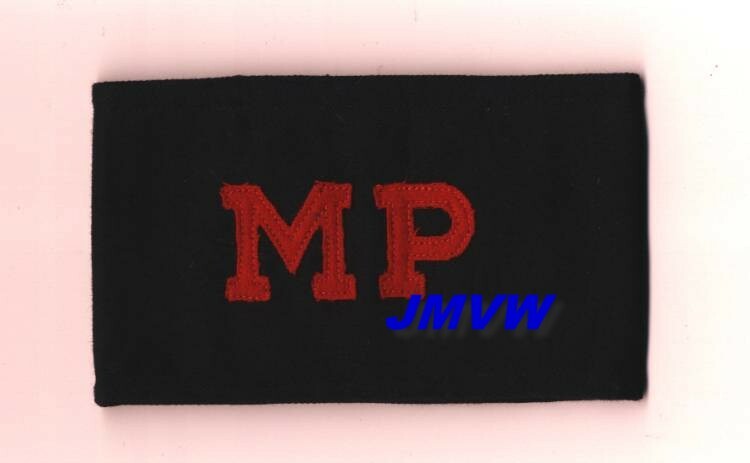 The British "MP" armband, red capital letters on a black armband. 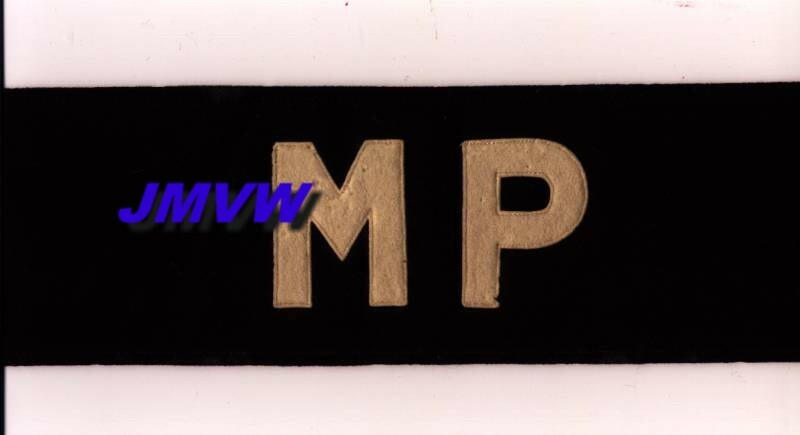 The RAF Station Police armband, also red capital letters on a black armband. 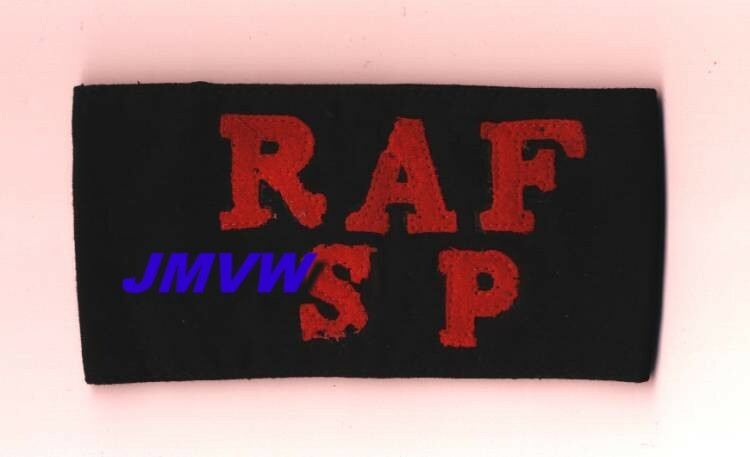 The RAF SP armband worn by a BAAPS II airman. The BAAPS armband, light grey capital letters on a dark grey armband with 2 light grey stripes. BAAPS II NCO's. The one on the left is wearing the BAAPS armband. 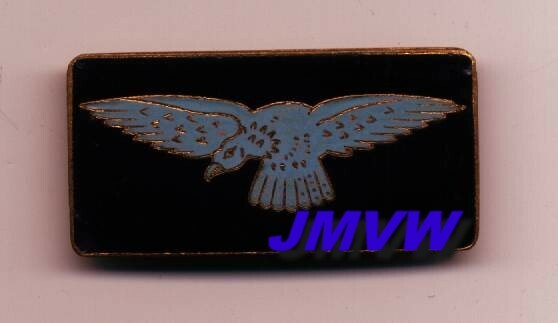 In 1946 a breast pocket badge version of the RAF eagle badge was worn by the men of the BAAPS II. The BAAPS II breast pocket badge.